Although the chance of a significant chemical emergency is small, the possible health effects can be serious. Accidental releases can occur anywhere at any time, as the result of a fire, explosion or chemical spill, not only at a fixed site but from a road or train accident. Shelter inside. The fresh air inside a building will provide protection for several hours. Shut all windows and doors, turn off heating, air-conditioning and fans, and close or cover vents. Listen to emergency service broadcasts to learn when it is safe to leave the home (ABC local radio: 774 AM – Melbourne, 91.1 FM – Bendigo, or www.cfa.vic.gov.au). You may not be able to see or smell anything because many gases are colourless and odourless. Evacuation is not the safest option when exposed to a short-term release of toxic chemicals. 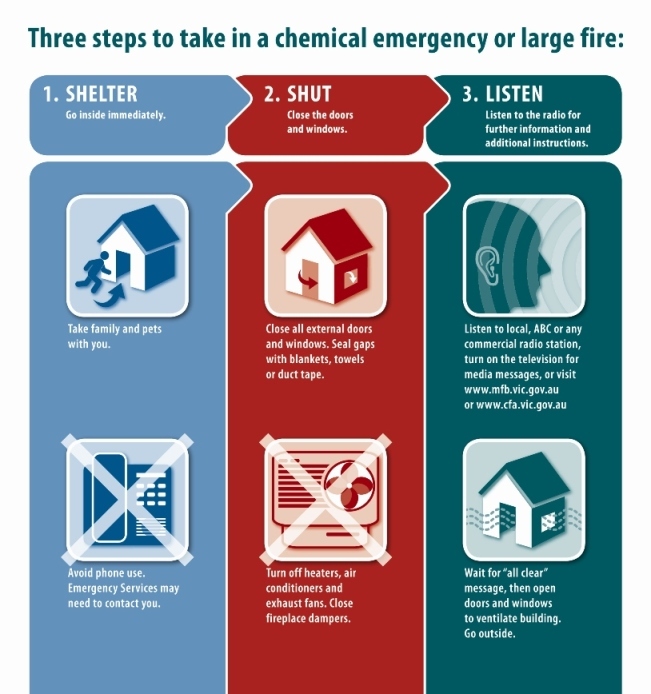 The shelter-in-place approach is best practice in chemical emergency management. Do not call triple zero unless there is a life threatening situation.